How to Do A Christmas Party Gift Auction-White Elephant Party Game! - So Festive! Hosting a White Elephant Party? Or want a fun Christmas party game? This Christmas Gift Auction Game is simple and super fun for all ages! A Christmas Party Gift Auction! We were then given Christmas Cash to use to buy our gifts! One of our friends was the “auctioneer” and started auctioning off each gift. Whoever bid the highest won that gift. Since each gift was wrapped, we didn’t know what we were going to get! I paid big money for a roll of toilet paper, while others ended up with gift cards and other awesome prizes. Since that first gift auction many years ago, my husband and I have continued this game with both sides of the family throughout the years. We recently held a “Christmas Kick-off Party” over Thanksgiving Break and played this game. And our families keep asking for it year after year. If you’re throwing an ugly sweater party, white elephant gift party, cookie exchange or even better a “Sockin’ Around the Christmas Tree” Tacky Sock party, this game would be a perfect fit! This game plus our Christmas Movie Trivia Game are our favorite go-to Christmas party games! 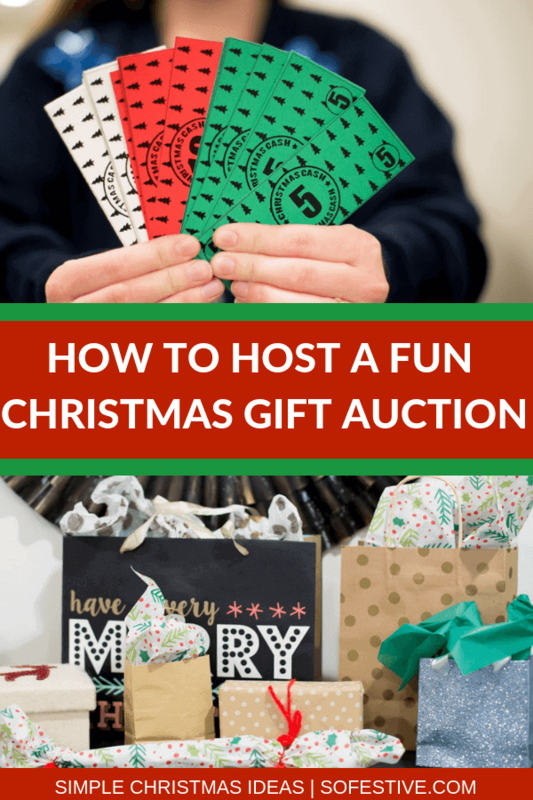 Why this Gift Auction is a perfect Christmas Party Game! If you’re looking for a fun, last-minute Christmas Party Game idea, do a Gift Auction! Gift bags and wrapping paper- no perfect wrapping required! 2. Everyone receives a certain allotment of Christmas Cash. I recommend at least $70-$100 per player, but the more the better. 3. Designate one person as the auctioneer. They will start the auction by holding up one of the wrapped gifts. Everyone starts shouting out their bid for that particular gift. The highest bid wins. 4. Have the person who won the gift with the highest bid open the gift to see what they bid for. *Laughter and/or tears may follow. That is the whole fun of this game! 5. Continue until all the gifts are gone. 6. For extra fun, the hosts should put together one “Grand Prize” for the end. This grand prize can be awesome or not… the person with the most cash at the end automatically wins the Grand Prize. 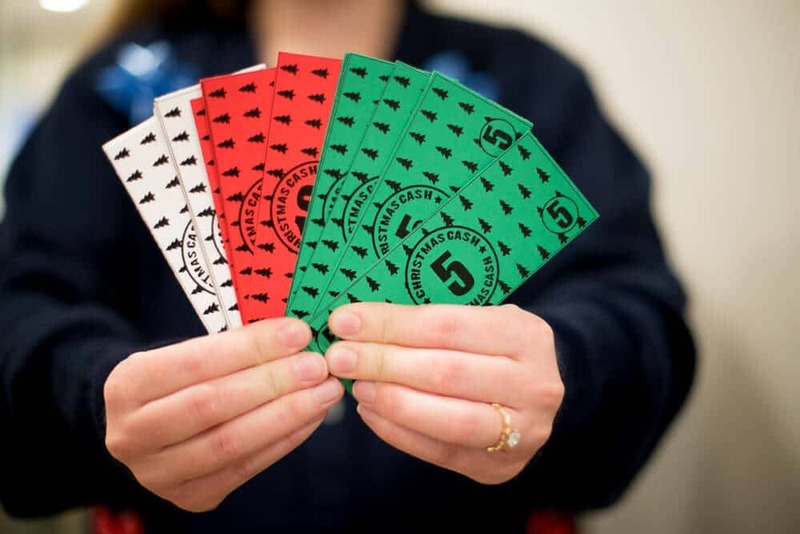 Now that you’ve decided to host a Christmas gift auction, you’ll need some Christmas Cash to play with! Tip: Prepare your Christmas Cash once and save to use it year after year. I’ve designed this Christmas Cash specifically for this gift auction party, but you could also use it for job charts, good behavior rewards, or Christmas stores in your classroom. For just a few dollars, you’re on your way to a fun and simple Christmas party game! Get Your Christmas Cash PDF emailed directly to you using the button below. What About Some Gift Ideas? Tip: Make sure you give your party guests a dollar limit so that everyone’s gifts will be equal. To do a gift auction, print off the Christmas Cash and separate into piles for each person. Have a your party guests bring a few wrapped gifts. And then auction off the gifts! 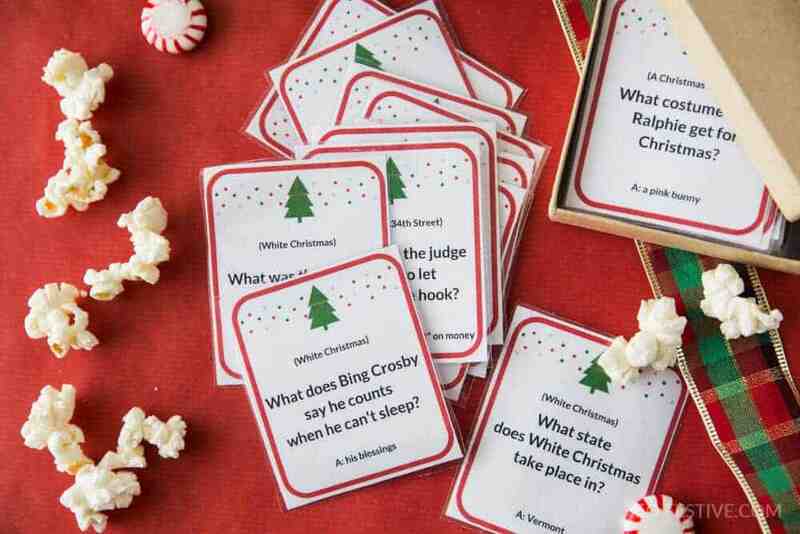 Check out the Christmas Movie Trivia Game for another fun Christmas party game! Have so much fun at your Christmas Party! Pin this before you forget! The Best Blueberry Sour Cream Pie! Is each person only allowed to win one time or can they get multiple gifts? You can win as many gifts as you have cash for! Is there a limi,t how many gifts a person can win, and won’t that leave people with no gift at All? we haven’t set a limit– so if you have cash left, you can buy the gift. you might spend all your money for one gift (if the bid gets that high) or you might get mulitple gifts if you don’t have to spend very much on them. A great way to change up the gift exchange, with minimal expense. I think I’ll buy the gifts and wrap them in decorated snowman and reindeer lunch bags. oh, that’s such a great idea! If everyone is giving the same amount of money how can you outbid someone? Say both of you are willing to spend the Mac that was given? Good question! I suppose that could happen! But, usually with all the gifts there are, it’s unlikely that everyone will have the same amount leftover. If you wanted to avoid this, you could play a game beforehand to earn different amounts… it always works out. This was the perfect game! We have such a wide variety of ages, that it was a challenge to find something everyone could enjoy. This was ideal because it allowed everyone to participate . We’d outgrown our traditional “right-left pass the present and swap” white elephant game and we’ve struggled to find a replacement. But everyone really loved this twist! The chance of getting a decent gift kept the interest high and the fact that you could bid as long as you have Christmas Cash kept people engaged the whole time instead of checking out as soon as they had a gift. Thanks so much for sharing!! This makes me smile. I’m so glad your family loved this gift auction!